Reviews of kits, books, rules, etc. Vichy — a forgotten force in WWII? The complexities of the Second World War in France and its territories ‘outre mer’ can’t have escaped most interested historians, and wargamers for that matter. From the summer of 1940, besides de Gaulle’s Free French, until the virtual civil war after the Normandy and southern France landings, and beyond into a half-life as exiles in the Reich itself, the major French military structure was the pro-Nazi Vichy regime of Pétain. 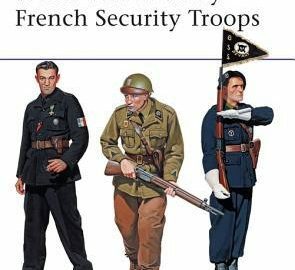 In Osprey ‘Men-at-Arms’ 516, Stephen Cullen examines ‘WWII Vichy French Security Troops‘. This long overdue title covers the structure and role of a multitude of uniformed organisations which propped up Pétain and his government and which fought almost on a daily basis with the Resistance, latterly finding themselves opposing SOE and even regular Allied forces in the fight for French soil. This is a well-written book and brings for the ‘D-Day and beyond’ wargamer an opportunity to bring to the wargames table a further army. Cullen doesn’t need a time-line for the short life of Vichy, but provides a detailed map of the division of Metropolitan France after June 1940. The new state acquired the police forces of the fallen Republic, the Gendarmerie and Police Nationale, but regarded them with mistrust. So, a host of new security organisations came into being. The most military of them was the Groupes Mobile de Reserve (GMR), motorised and formed into almost 90 Groupes with French weapons from surrendered military stocks, including 60mm mortars and light and heavy machine guns. He describes the GMR’s role in fighting the Resistance, including what must be regarded as the only battle fought by Frenchmen against Frenchmen on French territory, at Glières in 1944. Vichy were losing until German heavy reinforcements forced the Maquis to retreat. There were other uniformed organisations under arms for Vichy. Some lasted a short time, others like Pétain’s 600 man personal bodyguard and the Gardes des Communications lasted the life of the puppet state. The latter, some 7,000 strong, were responsible for the protection of the vulnerable railway network – their problems and casualties in this task can be easily imagined. The RAF and the Maquis ensured that. Paris, though outside the Vichy zone, is dealt with as a part of the overall pro-Nazi picture. The city produced a complex and competing range of groups and small arms units supporting the Germans and fighting the Maquis. The author describes four in some detail – all new to me. The legendary and detested Milice Francaise, the backbone of Vichy’s military role on the war, is considered thoroughly. It was made up of two elements, a full time force and a large number of what are best termed reservists. By the summer of 1943 they were 30,500 strong, uniformed, and well-armed, many with captured Sten guns from unsuccessful RAF supply drops to the Maquis. The role of what was to become the most detested of French collaborationist forces the Waffen SS ‘Charlemagne’ Division expanded rapidly (many of the Milices who survived the early summer of 1944 were drafted). They were active in fighting the Maquis, often in substantial encounters. They were predominant in the Glières Plateau fighting. The volume provides significant information about the uniforms, emblems and armament of all of the major groups, including women’s organisations. There are some surprising snippets, like the existence of Milice squads of eleven men armed with Stens, Lee-Enfields and two Bren guns. This is, in my opinion, a valuable addition to the published works on WWII in the west, on the resistance war and, indeed, on the vast upsurge of fighting behind the German front lines after D-Day. It gives wargamers the opportunity to involve another force in their table-top battles. The selected bibliography is short and includes only one English language title – Littlejohn’s now rather elderly ‘The Patriotic Traitors’ (1972). The other French language titles remind me of how much quality French language material is available in magazines published across the Channel. The monthly Militaria is a magnificently illustrated gem. The plates are not by any means of the Angus McBride quality and style. They hark back to the earliest of theOspreys but are very useful nevertheless. Plates C3 and D2 provide examples of older French kit in Vichy use, while several others, Fl, F3 and H3, give sound examples of the kit of the Milices towards the war’s end. The plates are backed by many excellent photographs and line drawings on markings, emblems and badges. Most useful for the late WWII wargamer. 10 out of 10. On the table top, the multitude of French armed pro-Nazi groups are not easy to replicate in 20mm and 25mm. I can’t find a Vichy-specific’or Vichy- convertible range anywhere. So, if you know one, do share the information. This is, I suspect a hole needing to be filled and hopefully soon. It seems the kind of set which HäT or Caesar might produce eventually. In 15mm the problem doesn’t exist. 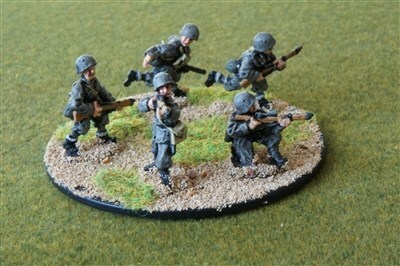 Turn to the Peter Pig ranges…The WWII French figures have several packs which fit the bill. Bear in mind that the Vichy security forces had little in the way of heavy weapons, captured Stens, rifles, elderly French issue weapons and a few LMGs and mortars would be all that any opposition would encounter in their hands. No armour or artillery either – this is a lightly armed infantry force with limited mobility. Let’s begin with French Command pack 40 and French SMGs pack 583. The greatcoated officer with pistol and Adrian helmet is ideal (plate F3) and the three SMG figures also fit the bill but you’ll need to run a thin file over the puttees to make them boots or long gaiters (plate H3). The SMGs can have a horizontal side magazine fitted to make a Sten. The officer in pack 226 of Alpine troops will make a decent Milice figure and pack 569, the prone French Resistance, will, with very little effort, make a Milice Bren team. For the rather different headgear seen in plates A2, D2 and D3, turn to the set of packs of French Motorised Troops, pack 227, running, pack 415 with rifles, pack 416 officers, and pack 417 LMGs are all useful. The puttees need the file treatment, but nothing else. I did take a look at packs 419, a 60mm mortar, and , 421, Hotchkiss HMGs but these would be very rare beasts in Vichy Milices or GMR units. Any of these figures, incidentally, would be easy to alter by using the pack 91 Carlist beret heads, with tassel trimmed off, to replace the Adrian or kepi. There’s some value in a glance at the Spanish Civil War ranges too, SCW2, Republicans in a beret, might suit or pack 6, command and pack 17, Assault Guard Command. Each has one or two poses of use. The Carlist Packs from SCW 48 to 51 are also worth a glance, again though the puttees and tassel trimming is necessary. For completeness look at the WWI French Officers, pack 182 – at least one figure there of use. Finally, if you want transport, then in WWI Belgian Cyclists, pack 224, with a different head and trimmed equipment will be of use. Many of the GMR, and Garde du Marechal (see plate D3) were motorbike mounted and the WWII German pack 193, with a French motorised helmet, would do nicely for a speedier patrol or response unit. That really is about it. There’s some additional transport in other ranges of course, but these figures will provide all you need to take on the Resistance or the Allied pan-dropped teams. As implied by the name, this is a simple set of rules, primarily designed for playing with children. There are two versions, the free “Panzer Kids Basic”, and the paid-for “Panzer Kids Deluxe”. The emphasis is on tank warfare, and the basic version only has rules for tanks. A nice touch for a game aimed at children is the “Mind Your Manners” section. Mostly common sense, it explains why the game is more fun for everyone if people don’t try to bend rules and take advantage. The rules are very simple. When firing, the firer rolls a D6 and adds the result to the firing tank’s attack value. If the total is greater than the target’s defence value, the target suffers a hit. Once a tank has taken three hits, it is destroyed. The deluxe version adds optional rules for wrecks, flank shots, damage, close range, hull-down, hull guns, anti-tank guns, elite units, roads, mine fields, objectives, and micro scale miniatures. The basic version includes stats for eight tank types. The deluxe version adds many more tank types, plus anti-tank guns. It also has instructions for working out the stats for any tanks not already covered. Four scenarios are included in the deluxe version, along with a brief WWII timeline. I’ve played a game using the basic rules with my two kids, aged six and eleven. They had three tanks each, and the game lasted about forty-five minutes, despite them spending much of their time hiding behind terrain. Both kids said that they had fun, so in that respect at least, the rules are a success. Both Panzer Kids Basic and Panzer Kids Deluxe are available as PDFs from Wargame Vault. 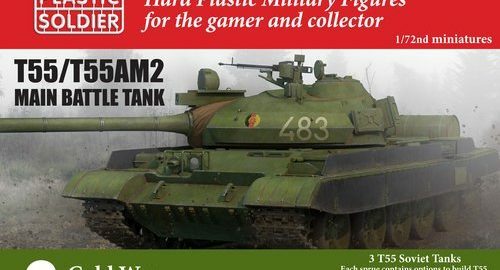 The box includes parts to make three tanks, each of which can be built as an original T-55, T-55A, or T-55AM. Since there are enough parts to make all three in any version, there will always be spare parts left over for the bits box. The kits are quick and easy to build. The tracks, for instance, are a single casting on each side, with wheels and track all in one piece. They lack some details. The coaxial machine gun and sight are missing from the turret, for instance. Still the finished model is unmistakably a T-55. They are sturdy, so should handle being played with on a regular basis. Given the number of armies that the T-55 have seen service with, this is a very useful kit for any post-war 20mm gamer. I believe S&S Models have plans for conversions, which will make these kits even more useful. 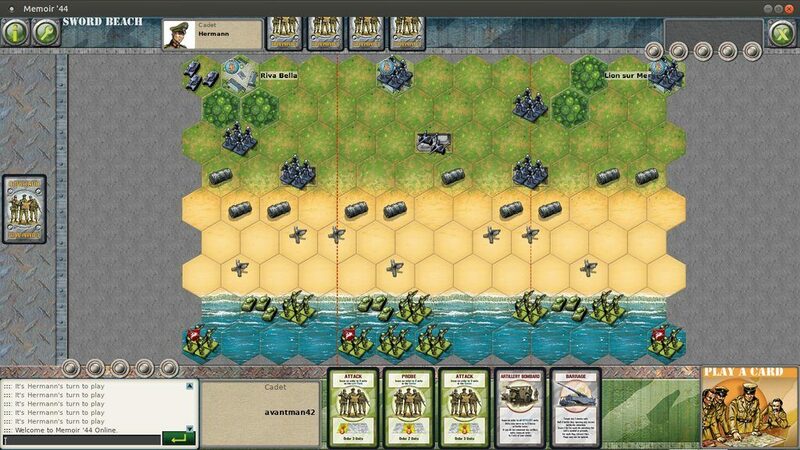 Memoir ’44 Online is available as a free download from Days of Wonder. Playing a game requires payment of in-game currency (called gold ingots). A few scenarios are free, but most cost between two and four ingots. You get fifty ingots when you first register, which is plenty to try the game. At the time of writing, ingots cost €8 for 200, €30 for 1,000 or €60 for 4,000. The €30 and €60 packs also include access to the scenario editor, which allows you to design and publish your own scenarios. In play, the computer version is very similar to the board game, so if you like the board game, it’s worth a try. You can play against a human opponent over the internet, or against one of two computer opponents. I’ve found that I enjoy playing against the computer. It’s good enough to give me a challenge without being unbeatable. The graphics look a lot like the pieces in the board game. There is in-game music and effects, both of which can be turned off if you prefer. There are lots of scenarios to choose from, with options to filter by year, front, etc. The listing gives the percentage of times each side wins, to give an idea of how balanced the scenario is. You can choose to play as the Allies or the Axis. The “Service Record” section shows the scenarios that you have played and the result. Personally, I’m fond of the board game as a quick, simple wargame. I find the computer version to be a good alternative, even quicker to play since there is no setting up or putting away. 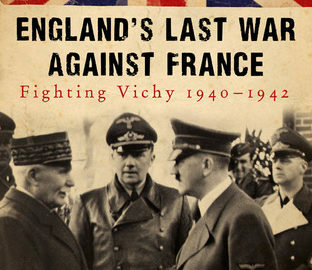 England’s Last War Against France charts the story of the undeclared war between Britain and Vichy France, between 1940 and 1942. The book is divided into four parts, each of several chapters. Part one starts before the Second World War, covering the background and Anglo-French relations during the First World War and inter-war years. Smith describes how relations between the two countries soured as the Germans advanced into France. It covers the diplomatic efforts to keep France in the war, and how and why France felt they had been abandoned by their ally. This part also covers the fate of the French fleet, including the infamous action at Mers-el-Kébir. Part two covers the campaigns in Africa and the Middle East. This includes actions to take over French Imperial colonies in Africa, Syria, and Iraq. Part three describes the campaign to conquer the island of Madagascar, and part four covers Operation Torch. Overall, it’s an interesting book, written in an easy to read style.